Tim Cook talks up Apple's new iPhones. 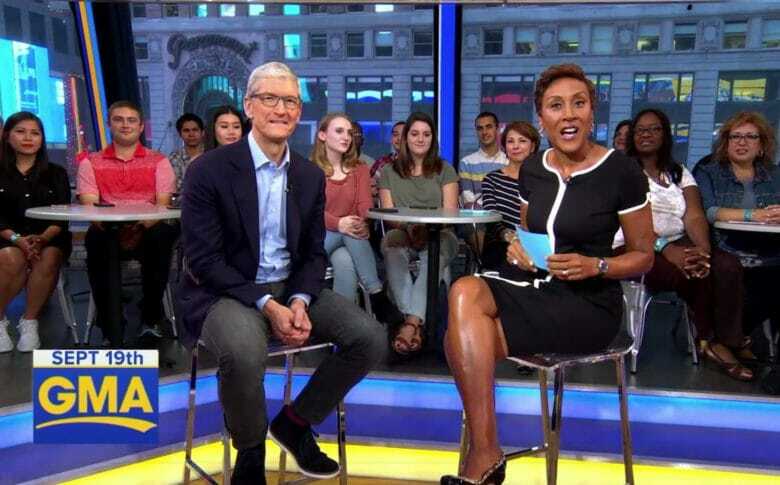 $1,000 for the iPhone X is a “value price” to pay for such a premium product, Tim Cook told viewers during an in-studio interview with Good Morning America today. In the 10-minute interview, Cook defended the pricing of the next-generation iPhone, talked about his excitement over augmented reality, discussed Steve Jobs’ legacy at Apple, and touched on the ongoing political topic of “Dreamers” in the United States — referring to illegal immigrants who were brought into the U.S. as children. Cook’s addressing of the iPhone X pricing was in response to a question sent in by a viewer. He noted that the price tag reflects that the fact that Apple has built “more and more technologies” into the handset, and said that it was actually good value for the amount of tech users were getting. He also pointed out that, thanks to trade-ins and subsidies, most users would not wind up paying the full $1,000 price tag. On the topic of augmented reality, Cook talked through a demo of AR being used to place chairs within the studio setting, and singled out education and shopping as two obvious applications of the technology. Previously, he has spoken out in support of Dreamers, and noted that 250 are Apple employees. Finally, Cook discussed Steve Jobs, and getting emotional at last week’s Apple keynote at the Steve Jobs Theater at Apple Park. Talking to Good Morning America, Cook claimed that he “could feel” Steve in the theater during the launch. He also opined about where Jobs fits into Apple’s thinking about future products.